Cabbage is the oldest vegetable, which brings us back to the kitchens of our grandmothers and is reminiscent of some old homely recipes. Natural juice of cabbage is most often made of white and red species and is not at all distasteful. This green plant is one of the very healthy and medicinal vegetables and often is present on our tables. Cabbage beverages for centuries were used as a remedy for diseases of the stomach, inflammation of the colon and constipation. It proved to be excellent in the treatment of gout, arthritis, rheumatism, arthritis, and other diseases. It is used for strengthening the immune system, cleansing the body of toxins, and improving blood count. Stay with us and below learn more about the nutritional properties of this medicinal beverage. Learn how to make a delicious freshly squeezed juice of cabbage and brine. Read what other herbs are best to combine. Benefits that cabbage provides to human body are thanks to an extremely rich composition. For it contains vitamins, minerals and healthy fibers. It is a rich source of minerals, calcium, potassium, iron, phosphorus, zinc, magnesium and copper. It contains all the most important vitamins A, B1 and B2, C, K and P. They are necessary for the proper functioning of the organism as a whole. Healing cabbage juice is for example richer in vitamin C than oranges. When it comes to minerals it is the best source of potassium, which plays an important role in the regulation of the heart, nervous system. In doing so it also affects the bowels and muscles. Cabbage contains calories in a small amount. 100 grams only has 23 kcal. Therefore, it is often used in diets. The most famous is certainly the cabbage diet, which is known worldwide especially among the female population. Cabbage contains 1,3g of protein, carbohydrates 6g, sugar 3g and dietetic fiber 2.5g. It is also a good source of riboflavin and amino acid glutamine. If you use it for treatment, it is best to use fresh, raw cabbage from organic farming. Which means that it is not treated with chemical products, and is safe for everyday use as a beverage. Since the cabbage is rich in minerals including significant representation of iron, zinc, magnesium and phosphorus, sipping this drink can greatly improve the blood count. First of all it is recommended to young women who have difficult periods, because this is the most common problems. People suffering from anemia, should regularly use it. According to some opinions, cabbage juice treats anemia the same as the highly valued beets. Drinking fresh juice of cabbage will relieve anxiety and nervousness which is increasingly recommended. These disorders affect a growing number of the population, and the main cause is considered fast and stressful lifestyle. Modern life flow and alienation have led to an increase in the number of people who suffer from depression. As an alternative treatment recommended is nibbling cabbage that is full of minerals and vitamins which boost the body. Cabbage juice can improve sleep and eliminate insomnia because it acts relaxing and soothing to the body. Cabbage in combination with honey does not sound too good, but it is excellent for the protection and treatment of lung inflammation. It works very successfully in the prevention and treatment of bronchitis and asthma, because it cleans the respiratory tract. If you have sour throat swish your mouth and gargle the cabbage juice. Cabbage has always been a good natural remedy for inflammatory processes. Freshly squeezed juice of cabbage for gastritis is a hit. It is a great choice for the treatment of ulcers of the stomach and duodenum. It is recommended to drink a full cup of the drink before each meal. The impact in the treatment of these conditions is thanks to the amino acid glutamine, which protects, and restores the mucous membrane of the stomach. It has a function in cleaning the intestine and the entire organism. Cabbage because of its composition has a mild laxative action, so it is recommended for people who suffer from constipation. It promotes regular bowel movements. An interesting fact is that as far back as in 1952 the vitamin was found in cabbage that has shown to directly heals ulcers of the stomach and duodenum, which was later given the name vitamin U (lat. Ulcus - boil). Helicobacter can be found in a staggering 80 percent of the population. It causes inflammation, enhances acid and is responsible for the formation of ulcers of the stomach and upper duodenum. People who are infected have symptoms such as nausea, bloating, pain in the upper abdomen, lack of appetite and bad breath. Often we feel satiety after consuming smaller amounts of food, dizziness and we have somewhat darker stool. It is believed that these bacteria may lead to the development of cancer. Fresh homemade cabbage juice is an antique natural remedy for helicobacter. Recommended is intake on an empty stomach, 2 dl per day. Cabbage has anti-cancer adhesive labels. It works preventively against cancer of intestine, bladder and prostate. This green vegetable contains sinigrin, which act preventively against it. In addition, squeezed cabbage juice has antioxidant properties. Cleans the whole body, but also the blood of toxins, prevents free radicals, and boosts the immune system. Cabbage is very grateful to prepare and goes well with other vegetables. So you can quickly figure out which combination you like best. The recipe for the cabbage juice, which we offer are easy to prepare and quite tasty. Cut a quarter of cabbage, which you previously well washed. Clean and chop a carrot. All put in a juicer and add half a glass of water. This is the basic recipe, which can be further upgraded. Add a little fresh ginger grated, celery or apple for an even better effect. Wash and chop 1/4 cabbage, peel a ripe banana and kiwi of medium size. Put in blender and add 1/4 cup of water. Turn on the camera and in a few minutes you will get the perfect drink for a healthy start to the day. All ingredients wash and cut. Slip into a blender and add a little water. Mix for a few minutes and the drink is ready. Instead of beetroot, occasionally insert an apple for variety. Red cabbage goes well with oranges and carrots. To make cabbage juice without the juicer is very simple. Take 500 grams of cabbage. Grate it on a greater, and then process it. Leave it for a while to stand, then strain through the cheesecloth. Thus obtained juice is kept in the refrigerator, but watch that it does not stand for long. It is best to drink it fresh and until all the ingredients are still there. It is full of B vitamins and valuable minerals. It is also used to relieve hangover. Cabbage juice is not the only recipe that we will share with you. The linings with leaf have also numerous benefits, and are primarily effective in the treatment of inflammation and swelling. Arthritis and rheumatism are inflammatory diseases that affect the joints, bones and muscles. Cabbage has anti-inflammatory properties and relieves the symptoms of these diseases. The most commonly used is cabbage with brandy placed on problem areas. In folk medicine these leaves were ironed and then applied on body parts affected by inflammatory processes. Cabbage juice as a drug is used in a number of inflammations, but also for the treatment of varicose veins. In the treatments used is lining of cotton wool previously soaked in cabbage juice, which is wrapped around the legs. This green vegetable is great news for fat people. 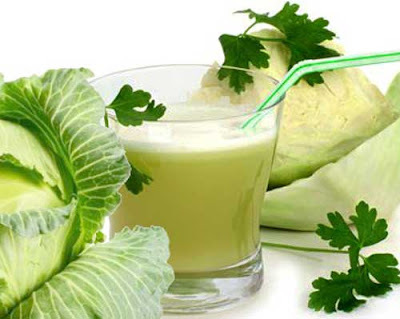 If you want to take off the pounds that have accumulated, cabbage juice for weight loss is the best choice. Sip slowly this soothing drink and it will eliminate excess fat. As we said, the cabbage has very few calories, so it is great for dieting, because it slows down the processing of carbon hydrates in fat. In addition, it is full of fiber and improves bowel movements, and promotes regular bowel. At the same time it is a phenomenal choice for complete detoxification of the entire body. In addition, all we have heard about the famous cabbage diet. It gives excellent results, and involves introducing a delicious soup with vegetables and natural cabbage. Who should not drink cabbage juice? As with any food intake it should be moderate and controlled. It can be consumed several times a day, half an hour before a meal. However, people diagnosed with peptic ulcers and gastritis are recommended prior consultation with the doctor. Although healing, with many benefits, cabbage juice during pregnancy requires caution when using. Mothers should pay attention to the input, and of course it is necessary to have consultation with a doctor who monitors your pregnancy. Pregnant and lactating women should know that cabbage has benefits with swollen breasts, especially after childbirth. For such problems mainly used are lining of cabbage. However, fresh cabbage juice for treatment or diet you will still have to make yourself. If you are interested in this text read more about this and find out about all the vegetables from the diet of soup of cabbage.